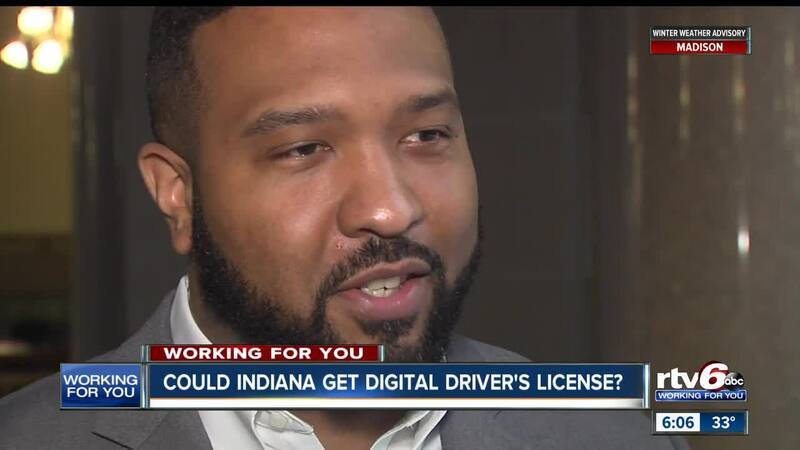 Could Indiana get digital driver's license? GARY — Could we soon keep our driver's license on our phones? Sen. Eddie Melton, D-Gary, introduced a bill that would allow drivers to have the option of carrying their plastic driver's license, or having their driver's license on their phone. "I think convenience is the number one priority, of course," Sen. Melton said. "We want to help streamline and make things more accessible for vehicles, especially as you are upgrading your license." Sen. Melton said their should be another option when driving or dealing with law enforcement. You would press down on the photo ID within the app, and a seal would pop up to prove it's real. "Iowa, Colorado a variety of other states have implemented and are in the process of implementing this digital technology," Sen. Melton said. RTV6 wanted to know what people think about this — having your driver's license on your phone through an app. Most people didn't even know that over a dozen states already had this law in place. "It'd be more convenient. It's kind of like we are getting to where these things are lifelines and it just makes sense to just adapt," Southport resident, Steve Breedlove, said. Lawrence resident, Latoya Bonds, said, "I keep my phone on my hip. That's one thing you don't like losing is your phone, so you carry that all the time." Some people like the efficiency when it comes to updating license information instead of waiting for the BMV. On south side resident, Maggie Lester, said she would never have her driver's license accessible on her phone. "Too many people get your information, everybody's scanning and hacking, it's just not a good idea," she said. "There's going to be an access code that you're going to have to print your phone," Sen. Melton explained. "You're going to be able to log into your account and deactivate your license from the application, if you have a lost cell phone. So there are multiple safeguards." Sen. Melton said they're working with the BMV and Indiana State Police to research a potential application and how it would work. He's hopeful the bill will make it to the Senate floor and sign it into law. "Let's make it an option. Let's move into the 21st-century and let's be one of those leading states who are on the forefront of this," Sen. Melton said. Different states use different vendors for their driver's license phone app. The Senator said they will decide which one they'd like to use here in Indiana through committee.